Searching for the perfect Valentine's Day dessert recipe that will wow your family, or that special someone? 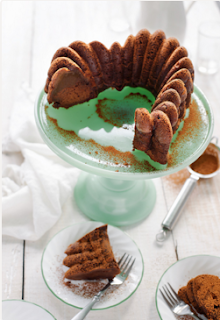 Terra's Kitchen's Mocha Bundt Cake is packed with love and flavor, not to mention also low in sugar! A Valentine's Day (or any day) chocolate indulgence with half the guilt and twice the jolt. This decadent, delicious mix of chocolaty goodness, with a hint of coffee flavor, is the perfect ending to an amazing Valentine's Day dinner! Generously grease a Bundt pan with butter (we used a heart-shaped Bundt for Valentine's Day). Set aside. In a medium mixing bowl, whisk together the flour, cocoa powder, baking soda and salt. Set aside.